for me, and many others in our family. Beautiful, inside and out. A heart of gold, that melted others with the softest of smiles. Her final four years of her life were spent at Owensboro Place, a retirement facility. It pained me to see her in such a state that required 24 hour care, but the family had no choice. She seemed to enjoy her time there, mostly, except for the food. However, I do not think she realized where she had been living, since we always told her she was in a rehab center, or her apartment. If she was more aware, she would have had a nervous breakdown if she knew where she was. I was always close to her, even when I was a small child. She shaped me to be the kind, and caring person I am today. These last four years, although painful, I spent as much time as I could with her. This last year, she had become incredibly difficult when it came time for her to eat. I would come out after work, and get her to eat. I was the ONLY person who could get her to eat. Despite the fact, she started to wither away; no longer the plump, yet jolly woman of my memories, but she retained her sharp wit and sarcasm. I would come out to see her after going to Hopkinsville for work, and tell her I went down there, only to have her retort, “You mean to tell me, they let you out of there?” in reference to Western State Hospital (psychiatric facility). What can I say? I’m going to miss the woman. She was a pillar of love and influence in my life. Watching her lay in that bed and pass was the hardest thing I’ve ever had to do in my life. Saying goodbye was the last thing I ever wanted to do to someone who has been such and important piece of my life. This last week, I’ve caught myself thinking, and wondering, what I am going to do now that she’s gone. I spent so much time with her, it’s unbelievable to think on. To have a great-grandparent that adored you, and told some of the wildest (and yet, TRUE!) stories from her past, was a privilege few receive. One of the hardest things I had to deal with since her passing, was to go home from work yesterday afternoon, at the end of the day. I used to leave the office, hop in my car, and drive down to see her. Instead, I no longer had a reason to go to the nursing home, since she’s gone. I didn’t know what to think, or do. I felt lost, like a lost puppy. The drive home was excruciating for me. Thinking back on all of those days just seemed trivial until April the 2nd. After that, it feels like I’ve lost my purpose in life. I miss her. 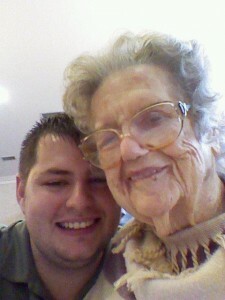 Without a doubt, I miss that rascally old woman. She was one of the most wonderful people I have ever known, and will ever know. There’s an empty space in my heart, where she had been all my life. This loss hurts more than I ever imagined, despite I had accepted the fact that it was coming soon. However, no matter how much you prepare, you are NEVER prepared for it. I miss her, but I will never forget her, and the things she taught me. I just wish I could sit with her, play a game of cards (war), and just sit and talk for hours, like we used to. I miss that. I miss her.